Kayak or canoe alongside a coastal inlet; hike a guided trail to a majestic lighthouse; hunt for antiques in a quiet harbor town; or just explore the countless maritime, historical, and cultural attractions that will leave you longing for more. This is a visit to the DownEast & Acadia region of Maine. The many miles of rocky coastline offer unforgettable opportunities to see, smell, and experience the great Atlantic Ocean. Rock climbing, hiking, miles of bicycle paths, cross-country skiing, groomed snowmobile trails—every season brings new ways to experience the great outdoors DownEast. Acadia National Park (home to 1,532-foot Cadillac Mountain is a recreational playground for outdoor enthusiasts and families. There are sightseeing tours by bus, boat, trolley, horse-drawn carriage, airplane, ferry, and schooner. Tip your toes into the cool, crisp ocean water while catching a glimpse of puffin playing nearby. Those seeking a thrill and an adrenaline-packed adventure will love the prospect of skydiving or taking a flight over Acadia for a great view of the park and surroundings. 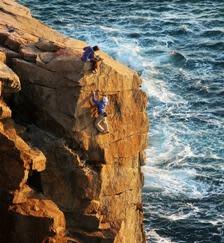 Acadia is also home to some of the highest climbable sea cliffs on the entire East Coast. A premier hunting and fishing destination, try your hand at landing a prize bear, moose, snowshoe hare, bobcat, deer, wild turkey, duck, or other game animal when visiting DownEast. Bow and rifle sporting is permitted by season and ATV enthusiasts are welcomed. There are over 750 miles of world-class ATV trails in DownEast Maine. Two major trails are accessible directly from the many area sporting and hunting lodges—the DownEast Trail System and the Cherryfield Food Trail System. The region is also a foremost fishing hub. Fish for landlocked salmon in Grand Lake Stream, West Grand Lake, or Long Pond. Or go brook trout or smallmouth bass fishing in one of the region’s crystal clear lakes or ponds. To learn more about hunting and fishing in the state, visit the Maine Department of Inland Fisheries & Wildlife. Don’t leave DownEast without experiencing the excitement of sailing or boating. If you’re not a do-it-yourself kind of person, consider booking a windjammer excursion, casual jaunt aboard a pontoon boat to view wildlife, scenic lake cruise, or a whale watching and sightseeing tour. Regardless of your chosen activity, Registered Maine Guides are nearby to help plan, organize, and safely guide you. They offer instruction and all the equipment you’ll need for a thrilling but safe outdoor adventure. Choose guided wildlife viewing and bird watching or opt for a guided tour or day of sightseeing on one of the many islands, lighthouses, or inland harbor towns. For families, there are countless beaches ideal for swimming, jet skiing, and sunbathing. Roque Bluffs State Park is a favorite with kids! You might also enjoy golfing by the shore at one of several 18-hole or smaller family-owned facilities that are reasonably priced and very accessible. For a full listing of the area’s many events, fairs and, festivals, visit the official Events page. You can also download the fully-interactive visitor’s guidebook. Home to a wide variety of specialty stores, antique shops, boutiques, outfitters, craft stores, and other retail shops and outlets, the DownEast & Acadia region of Maine is a world-renowned shopper’s haven. To plan a day of shopping, please see our DownEast & Acadia shopping and antiquing page. A region filled with surprises and possibilities, get lost in DownEast & Acadia and make a memory of a lifetime.